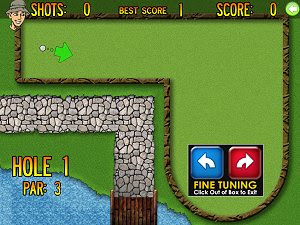 Minigolf Accessible is the follow-up to Minigolf 1-shot, expanding upon the ideas from that game and improving on the range of special access controllers. Players may now choose between different styles such as 1.shot key, eye-gaze, mouse, trackball, keyboard and others. This free PC game was created by ACoders in cooperation with OneSwitch and SpecialEffect, associations that are trying to make gameplay more accessible to players with some disabilities or mobility issues that prevent them from playing with the average controller, such as a mouse or keyboard. The result is a simple but effective game that manages to be entertaining even with controls such as a single key or the eye-gaze, based on the player’s eye movements. It’s an approach that should be followed by other developers in the future.